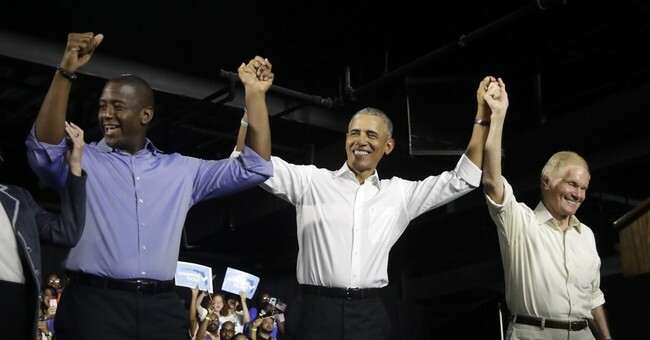 Obama Campaigned for Four Democrats in Close 2018 Races. They All Lost. Speaking of healthcare, Obama's signature accomplishment flopped on the merits throughout his presidency, then became less unpopular after he left office, following a series of changes to the law. He has since effectively admitted failure, embracing a reckless single-payer healthcare scheme to replace his own law, thus destroying America's private system and requiring giant tax increases on working Americans. Nelson led by roughly 2.5 points in the final polling average, but Rick Scott won the election, pushing Nelson into retirement. (2) Florida Governor - Along with his efforts to re-elect Sen. Nelson, Obama pushed hard for the up-and-coming, left-wing Mayor of Tallahassee, Andrew Gillum, the Democrats' gubernatorial nominee. Gillum faced ethical headwinds in the final weeks of the campaign, to which he responded by playing the race card. Obama went all-in for Gillum, who led in 16 of the final 17 polls of the state, amassing an apparent edge of close to four percentage points. He lost to Republican Ron DeSantis. Two days later, voters in the state elected Republican Mike Braun by nearly six percentage points. The GOP nominee outperformed his polling average by roughly seven points. 3) 4.5 Hour lines. Yes, there were long lines at some polling locations. That happens on election day. GA does have early voting options. Local officials manage those place and it has little to do with the Secretary of State. In summary, Barack Obama has -- very predictably -- been engaged in far more direct partisan activism and criticism of his successor than is traditional. He's weighed in on political matters relatively often, sometimes with characteristic tendentiousness, since leaving office. Some things never change. And one of those things, it seems, is Obama's reverse Midas touch on fellow Democrats. His party lost approximately 1,000 legislative seats at the federal and state levels during his eight years (Democrats have made some headway in state chambers over the last two years, but not nearly as much as they'd have liked), having gotten especially decimated during midterm election cycles. The opposition had a pretty good night nearly two weeks ago, but that success didn't apply to the four candidates in competitive races that Obama chose to grace with his presence. I'll leave you with this biting yet accurate zinger from Allahpundit: "Barack Obama: Delivering big for the Republican Party every four years since 2010. The only thing he’s more effective at selling than GOP candidates in midterms is guns." Obama has demonstrated that he's adept at getting one Democrat elected: Himself.